﻿ Maakanaa Lodge, Male City and Airport | FROM $66 - SAVE ON AGODA! "Pick up service was good"
Have a question for Maakanaa Lodge? "All staff were in general friendly." "WiFi was strong and fast." "Love the host and clean room!" "Overall a pleasant and comfortable stay." Whether you're a tourist or traveling on business, Maakanaa Lodge is a great choice for accommodation when visiting Male City and Airport. With its location just 9 km from the city center and 8 km from the airport, this 3-star hotel attracts numerous travelers each year. With its convenient location, the hotel offers easy access to the city's must-see destinations. Maakanaa Lodge offers impeccable service and all the essential amenities to invigorate travelers. A selection of top-class facilities such as free Wi-Fi in all rooms, luggage storage, Wi-Fi in public areas, car park, airport transfer can be enjoyed at the hotel. Experience high quality room facilities during your stay here. Some rooms include television LCD/plasma screen, internet access – wireless, internet access – wireless (complimentary), non smoking rooms, air conditioning, provided to help guests recharge after a long day. Besides, the hotel's host of recreational offerings ensures you have plenty to do during your stay. With an ideal location and facilities to match, Maakanaa Lodge hits the spot in many ways. "Nice, big and clean room." This place is awesome, complimentary airport transfers and very clean rooms. Doesn’t even feels like a lodge, maybe a beach chalet . Breakfast are not included in some bookings, you can additionally add them on when you check in. Checking in was a breeze as well. Friendly staffs. I love this family-run lodge. The owners and staff are kind and patient. The room is clean and spacious enough. Wifi-internet connection is good too. I love the food and the land transfer service. Well-recommended! All staff were in general friendly. The lady in charge especially was very helpful. However I’ve only received their reply regarding airport pickup after 2months from my first message, right before my trip so I would appreciate if they would have reply me earlier to ease my concern. As my resort had contacted them, they had passed me all the info I needed for the flight to the resort and arranged drop off accordingly, which makes the transfer smoothly. WiFi was strong and fast. Room facility are sufficient. Good service even we arrived at 11pm. with anothet pair of copules. Staff are helpful. One thing to note: Transportation fee for both ways to airport are chargeable seperately (US$5 per person per trip). Hotel will arrange the types of car depending on the number of pax. You may need to share a car with other travellers. A very good quality hotel for a one night stay. You would be charged a USD5 per person per ride for airport pick-up and drop-off (we think this price is very reasonable). The owners of the property would liaise with the resort in advance to ensure smooth transition to your resort in the morning. Room is modern and clean. Hot water supply is stable. Bathrooms are of reasonable size so OK for a comfortable shower. All basic amenities are provided. Would highly recommend this property. Hotel is on the same island as the airport, just a short drive. Flawless airport transfer to and from the hotel. Friendly and helpful staff, who called to confirm with our resort for next day’s seaplane transfer even before we checked in. Extremely clean room. Perfect overnight stay before going to your dream resort. I booked this accommodation based on the amazing review mark that this place has obtained. Having stayed there myself, I understand now why it has such high rating. The service and response time was fantastic, the room was clean and spacious. The only one thing that I did not find in the room was a hairdryer (but still, I did not make a query at the reception - had I done so, I would probably have gotten one). I stayed overnight at Haakanaa Lodge before joining a diving liveaboard adventure. Haakanaa Lodge was perfect for this and for others in transit to an island. Shaheen and Habeeb are the extremely friendly hosts and all their staff are equally helpful and friendly. Complimentary airport pickup and drop-off is offered and this was timely. My room was a good size and was very clean and well maintained, as were the other Lodge facilities I saw. It is true that there is a lot of construction on Hulhumale and another building is being built nearby (as at Sept 2018) but construction stops at night so I still slept well, my bed was very comfortable. The Lodge also has a bike they allow guests to use for free, which I did to explore the island. I would also recommend getting the breakfast when booking or USD 10 p/p on arrival. The breakfast was more than sufficient and also included eggs cooked to order - also try the local tuna dish. I thoroughly recommend Haakanaa Lodge for transit stopovers. The room is very clean and new. Very comfortable to stay. Staffs are helpful. Airport transfer arranged as per request. No complaints. Highly recommend. Our flight arrived late at night. The service they have from airport transfer, checking in and out, the seaplane confirmation, etc are amazing, They will really take care of you. Staying here feels like home. The place is very well kept. Smells good. They have spacious room, big bathrooms, very clean too, and comfortable bed. This place is perfect. Wish to have stayed longer, there is always a next time. Free transfer from airport, easy car access without getting across the island. Hotel is clean and spacious. Friendly and helpful staff, the only issue - shower has to be quick, hot water runs out real fast. Let me tell you that at first, i was a bit unsure on whether to book a "lodge" but i did anyway based on the reviews and boy was i glad i did. Shaheen and her husband are the most gracious, helpful, and courteous hosts i've ever encountered. We stayed at 2 different 5-star resorts in Maldives and chose Maakanaa Lodge to be our transit hotel on the way back to L.A. and their service is second to none (better than the 5 star resorts). The room was immaculately clean, air-con is nice and quiet, modern ammenities in the room, transport service was on time. Shaheen even gave me updates about my flight. I asked Shaheen what I needed to buy and she told me where to go step by step. Staff just went out of their way to make our stay very comfortable. I would definitely recommend this lodge. When you are in Male or Hulhumale, look no further, Maakanaa lodge is the place to be!!!!! Thank you Shaheen and hubby!!!! Just for a night before seaplane flight. The experience was absolutely wonderful. Splendidly friendly people. Helpful in anyway one can ever imagine. Hotel was splendidly clean and well furnished. Really pleasant. Thank you so much for accommodating us. Stayed for a night upon arrival and this hotel took me by surprise, its very warm and cozy, the staffs are friendly and rooms are clean. The most important thing is i feel safe staying in this hotel. We had a late flight and must wait til morning to catch the seaplane to our 5 stars resort. The hotel was very helpful they even contact us asking why the resort has not let them know the morning seaplane schedule (no idea why the resort fail to do this but good thing Maakanaa did not forget about us!) Everything was smooth from picking us up from airport to dropping us off in the morning. Breakfast was good and filing. They offer to make us some fried eggs right the way when they saw us looking at hard boil eggs with hesitation (we don't usually have hard boil eggs for breakfast). The room was very new and very clean. For the price you pay, it's totally is a perfect solution for the late night flight. If ever you need a place for your layover in Maldives, this is THE place for you. The service is beyond compare. From the pickup to the dropoff -- their warn smiles take off a lot of load off your shoulders. Even before landing in the airport, the arrangements were seamless and painless. Upon arrival at the Lodge, the owners' warmth radiates. They took care of our transfer arrangements too. The place is clean and well taken cared of. The breakfast is also filling. It is home away from home. 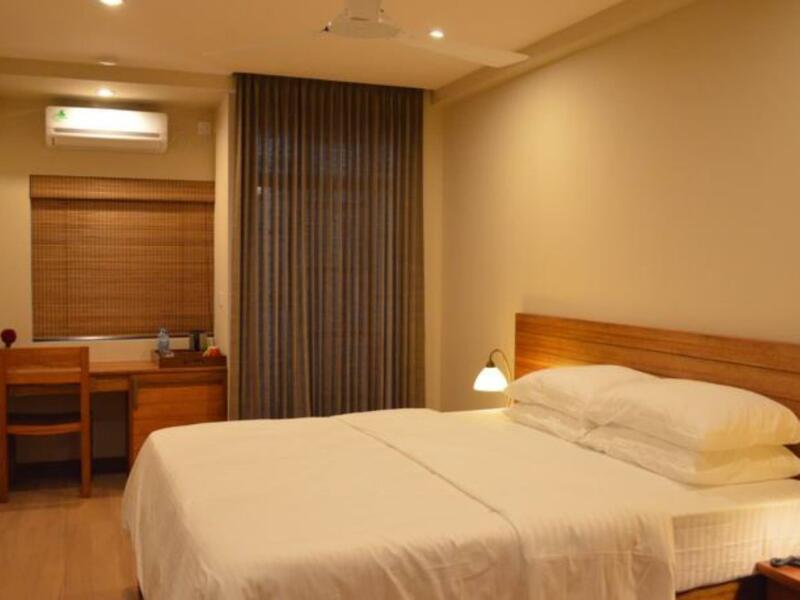 Location-wise, it is near the beach and far from the hustle and bustle of Male. Do drop by the Lodge, you wont regret it. I would rate 6 stars if I could. Excellent hosts who took effort to connect with guests and made sure everything was alright. Pity we only stayed for 1 night as we were transiting to an island from a night flight. Room and bathroom were clean and spacious! Bed is huge and comfortable. It comes with complimentary car transfer but you'll need to contact them beforehand to give flight details. Breakfast was simple but adequate. I strongly recommend Maakanna Lodge if you're intending to stay in Male.